Received May 28, 2018; Revised June 13, 2018; Accepted June 19, 2018. To investigate whether the Minimal Clinically Important Difference (MCID) clinically defines improvement of Berg Balance Scale (BBS) scores in people with acute stroke in response to rehabilitation. Seventy-three participants with acute stroke participated in the study. Balance evaluation was performed using the BBS. All patients received rehabilitation with physical therapy for 4 weeks, 5 times a week, for 2 hours and 20 minutes a day. An anchor-based approach using the clinical global impression was used to determine the MCID of the BBS. The MCID was used to define the minimum change in the BBS total score (postintervention-preintervention) that was needed to perceive at least a 3-point improvement on the global rating of change. Receiver operating characteristic (ROC) curves was used to define the cut-off values of the optimal MCID of the BBS in order to discriminate between improvement and no improvement groups. The optimal MCID cut-off point for the BBS change scores was 12.5 points for males with a sensitivity (Sn) of 0.62 and a specificity (Sp) of 0.89, and 12.5 points for females with a Sn of 0.69 and Sp of 0.85. The area under the curve of the ROC curve for all participants were 0.84 (95% confidence interval [CI], 0.72; 0.95, p<0.001), and 0.89 (95% CI, 0.77; 1.00, p<0.001), respectively. The MCID for improvement in balance as measured by the BBS was 13.5 points, indicating that the MCID does clinically detect changes in balance abilities in persons with stroke. Stroke is a central nervous system disease caused by failure of blood supply due to ischemia, hemorrhage, heart disease, and diabetes . Stroke prevalence is the highest proportion among the causes of mortality, and it is accompanied with disorders and dysfunction according to the amount of brain damage after survival. Approximately 85% of persons with stroke experience hemiplegia and motor disorders . Stroke survivors have emotional problems and neurological symptoms, such as hemiplegia, visual impairment, sensory deficits, dysphagia, cognitive dysfunction and dyskinesia, ataxia, and depression depending on the degree of damage . In addition, stroke leads to changes in several factors, such as normal postural tone, maintenance of balance, and biomechanical characteristics of muscles associated with muscle weakness. Impairments of body function is creates difficulty with performing independent gait due to decreased balance function, velocity, and endurance . Thus, persons with stroke have many difficulties, such as activities of daily living, functional movement and balance ability . Balance ability is mediated by the interaction of the sensory, motor and cognitive systems. Reasons of loss of balance include various factors, such as muscle weakness, decreased sense of balance, decreased range of motion, exacerbation and spasticity of the stretch reflex, and decreased motor function . Those with stroke have many problems, such as decrease in quality of life, avoidance of gait, increased phobia of gait caused by balance disorders and imbalance of weight-bearing [5,6]. A study reported that stroke survivors have a higher frequency of falls compared with healthy subjects . In particular, the fall rate in persons with acute stroke is 14.0%–64.5% . Balance training is one of the most important training during the early rehabilitation stage . Motor and function rapidly recover within 3 months after stroke . There are many balance rehabilitation training methods, such as task-oriented training, neurodevelopment therapy, proprioceptive neuromuscular facilitation, progressive resistance training, treadmill training, auditory feedback, virtual reality training, robotic rehabilitation training, range of motion training, strengthening and aerobic exercises, functional electronic stimulation therapy, constraint-induced movement therapy, underwater treadmill training, and mirror therapy [1,2,5,10]. Persons with acute stroke need objective and systematic evaluations and treatment to improve their balance ability . The Berg balance scale (BBS) is a fourteen-item scale that assesses the balance ability and risk for falls in persons with stroke by evaluation of their performance. The BBS supplies information on balance ability as well as balance ability before and after intervention. Many studies reported that BBS scores of those affected by stroke significantly improved after various interventions, indicating improved balance [12-16]. However, statistical changes are not always meaningful for patients . The minimal clinically important difference (MCID) is defined as the smallest difference in scores in the domain of interest which patients perceive as beneficial and which would mandate, in the absence of troublesome side effects and excessive cost, a change in the patient’s management . In the past, the MCID has shown whether there was a statistically significant difference. Although very small differences can be noted statistically, it is not clinically important. Therefore, the MCID is necessary to estimate the minimum value of clinically important changes in scores in order to know for clinical significance . The MCID can be calculated in various ways. However, the use of the Patients Reported Outcome Measure (PROM) is recommended, and the Global Rating of Change (GROC) is one of the used PROM [19,20]. Using PROM to measure the results after intervention can help to minimum change amount expected by the patients and provide patient-centered medical services. Also, use of PROM can utilize the quantitative changes in the process of clinical decision making by the medical staff, manager, and policy maker . Many studies using the GROC reported various assessment tools, such as the Fugl-Meyer assessment, Barthel index, and velocity [9,22-25]. The MCID of the BBS was 3 points in a study in patients with multiple sclerosis . However, this MCID value cannot be applied to persons with stroke. The MCID may vary by diseases, conditions and country. The MCID of the BBS for persons with stroke has not yet been studied. Therefore, investigations are needed to find the MCID of the BBS for stroke survivors in Korea. It is necessary to provide rehabilitation for persons with stroke, estimate the MCID, and evaluate the result of improvement of balance ability as a patient-centered result. Therefore, this study was conducted to investigate the MCID of the BBS using GROC after interventions for persons with acute stroke. Participants were recruited from the Departments of Physical Medicine and Rehabilitation of Wonkwang University Hospital in Iksan between November 2017 and April 2018. The inclusion criteria participants were as follows; 1) persons with stroke caused by cerebral hemorrhage and cerebral infarction; 2) inpatients who were referred to physical therapy; 3) time since the stroke onset is less than 3 months; 4) those who were age 18 years and older; 5) patients with Mini-Mental State Examination-Korean (MMSE-K) scores of 20 points or more. Persons with communication disorders (e.g., aphasia, visual defect, hearing defect) and severe medical problems (e.g., brain tumor, fracture, cardiovascular disorders, respiratory problems, severe dizziness) and emotionally unstable person were excluded. The sample size was calculated to have a sensitivity (Sn) of 0.85, specificity (Sp) of 0.70, and a positive likelihood ratio (LR+) of 2 . A total of 73 participants were included in the study. This study was approved by the Wonkwang University Institution Review Board (Approval No. WKIRB-201803-BM-013). Informed consent was obtained from all participants. This study was conducted at the university hospital, which treats approximately 130 patients with stroke daily. All participants received physiotherapy and occupational therapy. The physical therapy program consisted of NeuroDevelopmental Treatment (NDT) for 30 minutes, functional electrical stimulation using an electrical stimulator for 20 minutes, balance training and muscle strengthening exercises for 30 minutes using a continuous passive motion, standing frame and stationary bicycle. The occupational therapy program consisted of 20 minutes of postural control training, 20 minutes somatosensory stimulation therapy and 20 minutes of exercise using therapeutic balls. The physical and occupational therapy programs were provided once a day for a total of 2 hours and 20 minutes a day, 5 times per week, for 4 weeks. Eight physical therapists provided physical therapy to the patient. All 8 participating therapists were certified in NDT. The therapists have 5-10 years of experience and treat approximately 14 patients per day. Balance was assessed using the BBS. The BBS consists of 14 items that examines the ability to sit, stand, reach, maintain single-leg stance, and turn. The performance of each item is evaluated on a scale of 0 (cannot performance) to 4 (normal performance), with a maximum total score of 56. Higher scores indicates good balance function. The BBS has been used to assess balance in persons with stroke in a clinical setting. Blum and Korner-Bitensky  have reported that the BBS has strong internal consistency (Cronbach α =0.92-0.98), interrater reliability (intraclass correlation coefficient [ICC]= 0.95–0.98), and intrarater reliability (ICC=0.97) when used in persons with stroke. Baseline BBS scores were assessed (patient’s admission to physical therapy) and at follow-up (4 weeks after treatment) by a therapist who was not involved in this study. The patients’ perceptions of the magnitude of change in balance was rated using a 15-point GROC scale. After 4 weeks of treatment, a therapist who was not involved in this study asked the patient the following questions: “Is there a change in the current balance function compared to when you started physical therapy?” If patients stated “no change”, the score was rated as 0. If patients stated “better” or “worse”, the patient was asked, “How much better or worse is your balance function?” Subsequently, we offered the 7-point response options ranging from +7 (a very great deal better) to +1 (a tiny bit better) for “better” and −7 (a very great deal worse) to −1 (a tiny bit worse) for “worse” . Somewhat better (3 points) on the GROC scale was considered to be a meaningful change perceived by the patient . Patients were dichotomized as improved participants with a change of more than 3 points, and non-improved participants with a change of less than 3 points on the GROC scale. The frequency, mean and standard deviation of variables were calculated. Age, height, weight, body mass index (BMI), BBS scores, MMSE-K score and time from stroke to admission to rehabilitation therapy program (stroke onset) between improved participants and not-improved participants were analysed using an independent t-test. The gender, diagnosis and affected side between improved participants and not-improved participants were analysed using the χ2 test. The change in BBS scores was calculated by subtracting the BBS scores obtained before treatment from the BBS scores obtained at 4 weeks after the therapy program. The BBS scores between improved participants and not-improved participants were analysed using the Mann-Whitney U-test. The correlation between the BBS scores and the GROC scores was analyzed using a Spearman correlation coefficient. The receiver operating characteristic (ROC) curve was used to obtain the MCID of the BBS score. Optimal cutoff values were determined at the point of the greatest Sn and Sp. The accuracy of the cut-off value was discriminated by the area under the curve (AUC) from the ROC curve and LR+. Eighty-five participants with stroke were recruited in the study, but 12 of them were excluded because they had an MMSE-K score lower than 20. Seventy-three patients participated in the study, and all of them had completed the treatment sessions from the initial time and up to 4 weeks, as well as the follow-up assessments. Demographic and clinical characteristics of the participants are presented in Table 1. Participants were a mean age of 63.94 years old and 47 participants (64.4%) were men. Sixty-nine participants (94.5%) had cerebral infarction. There were 45 participants (61.6%) who had left hemiplegia, 17 participants (23.3%) had right hemiplegia, and 11 participants (15.1%) had bilateral hemiplegia. The mean time from stroke to admission to rehabilitation therapy was 1.79 months, indicating that the participants were in acute stage. Forty-two participants (57.5%) rated their balance function as more than 3 points (somewhat better), and thirty-one participants (42.5%) rated their balance function as less than 3 points after treatment for 4 weeks. Of the 32 not-improved participants, 7 participants (9.6%) rated no change and 8 participants (11.0%) rated themselves as worse. There were no significant differences in age, height, weight, BMI, gender, cerebral hemorrhage, cerebral infarction and MMSE-K scores between the improved and not-improved participants. The mean MMSE-K score was 23.87, representing mild impairments in cognition level. In the not-improved participants group, the stroke onset was longer (p<0.01), and the number of participants with bilateral hemiplegia was higher (p<0.05). The mean BBS score before treatment was 14.19, demonstrating that the balance function was low. The BBS baseline score of not-improved participants were significantly lower (p<0.05) than the improved participants. The BBS scores after 4 weeks of treatment and the BBS change scores were significantly higher in the improved participants group than the not-improved participants group (p<0.001) (Table 2). Significant correlations were found between the GROC score and BBS score after 4 weeks treatment (r=0.61, p<0.01) and the GROC score and the BBS change scores (r=0.69, p<0.01). The MCID results were associated with the AUC, Sn, Sp and LR+ for persons with acute stroke (Table 3). The MCID of the BBS change scores was 12.5 points in persons with acute stroke with a Sn of 0.64 and Sp of 0.87. The AUC of the ROC curve was 0.86 (95% CI, 0.77; 0.94, p<0.001), indicating moderate accuracy (Figure 1). The MCID of the BBS change scores was 12.5 points in male participants with a Sn of 0.62 and Sp of 0.89, and 12.5 points in female participants with a Sn of 0.69 and Sp of 0.85, The AUC of the ROC curve for male and female participants was 0.84 (95% confidence interval [CI], 0.72; 0.95, p<0.001) and 0.89 (95% CI, 0.77; 1.00, p<0.001), respectively. Using the PROM has many advantages that patients satisfy participation in personal problems and goals, and effective physical therapy, which can be better offers greater benefits to physical therapist [21,28,29]. Thus, patient-centered care is recommended and generalized in clinical practice. Previous studies have also recommended patient-centric care . Patient-centered care has the advantage where patients increase their outcome, information of disease, and reducing costs associated with intervention [31-33]. Therefore, our study has determined a clinically meaningful improvement of balance in persons with acute stroke. The MCID of the BBS in our study was 12.5 points. This score is interpreted as an increase by 12.5 points or more is a clinically meaningful improvement in balance. In our study, the anchor-based MCID of the BBS was 12.5 points and the distribution-based MCID of the BBS was 5.24 points. The difference of the anchor-based MCID and distribution-based method was 8.26 points. The results indicate an important reason for the use of the PROM in the clinical setting. If a BBS assessment score increases above 5.24 points, the therapist will think that he has achieved the treatment goals of improved patient balance. However, motivation, treatment reliability and treatment satisfaction is reduced because the improvement of 5.24 points is different from the evaluation of patients. In conclusion, stroke has a negative impact on balance and function. In the previous study, satisfaction with medical care was closely related to age and physical function . The results of our study are in agreement with the previous study. The interaction of satisfaction and age was found to be 2.71 points for the group who were 64 years of age or less, 3.44 points for the average score of GROC for the 65 to 74 years of age group, and 1.41 points for the GROC group that was above 75 years of age. The results of the interaction between satisfaction and the physical function, the average change of the BBS before and after intervention was 13.74 points for the group under 64 years old, 15.19 points for those who were 65 to 74 years old, and 8.53 points for those who were above 75 years old. The results confirm that the BBS score change ranking and GROC ranking are consistent with each group. In our study, it was confirmed that the better the satisfaction level of the patient, the better the balance ability, rather than age. People experience differences in status and opportunities between men and women. The process continues and accumulates until old age, and there may be differences in health status . Therefore, we investigated the MCID according to gender. Previous studies reported that men have a significantly higher ability to maintain balance than normal women . However, there was no difference in the dynamic and static balance between genders in persons with stroke . In our study, there was no difference in the MCID between the male and the female participants. The accuracy of the MCID was moderate based on the AUC from ROC curve. There are a few limitations in our study. It is difficult to generalize the results to all age groups because the age of the subjects is high. No re-evaluation with follow-up was made. In addition, it is difficult to generalize and to apply the results to persons with chronic stroke since this study included participants with acute stroke. Thus, anchor-based MCID values should be identified not only for acute and elderly patients but also for persons with chronic stroke in future studies. This study provides the MCID of the BBS in persons with acute stroke. We established that the MCID of the BBS was 12.5 point in persons with acute stroke who are undergoing rehabilitation. This MCID value can be useful for therapists to determine whether or not the BBS change scores have reached a clinically meaningful change. Fig. 1. Receiver operating characteristic curve and area under the curve (AUC) considering the categorization of more than or less than 3 points of improvement on the global rating of change scale. AUC is 0.86 (p<0.001). The minimal clinically important difference was calculated the point on the curve closedt to the upper left-hand corner of the graph which represents the point of optimal sensitivity and specificity. Time from stroke to admission to rehabilitation therapy program. 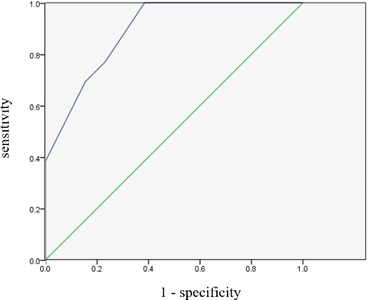 MCID: minimal clinically important difference, BBS score: Berg balance scale, AUC: area under the curve, Sn: sensitivity, Sp: specificity, CI: confidence interval, LR+: positive likelihood ratio. Prange, GB, Jannink, MJ, Groothuis-Oudshoorn, CG, Hermens, HJ, and IJzerman, MJ (2006). Systematic review of the effect of robot-aided therapy on recovery of the hemiparetic arm after stroke. J Rehabil Res Dev. 43, 171-84. Saposnik, G, Teasell, R, Mamdani, M, Hall, J, McIlroy, W, and Cheung, D (2010). Effectiveness of virtual reality using Wii gaming technology in stroke rehabilitation: a pilot randomized clinical trial and proof of principle. Stroke. 41, 1477-84. Trombly, CA, Radomski, MV, Trexel, C, and Burnett-Smith, SE (2002). Occupational therapy and achievement of self-identified goals by adults with acquired brain injury: phase II. Am J Occup Ther. 56, 489-98. Belgen, B, Beninato, M, Sullivan, PE, and Narielwalla, K (2006). The association of balance capacity and falls self-efficacy with history of falling in community-dwelling people with chronic stroke. Arch Phys Med Rehabil. 87, 554-61. Geiger, RA, Allen, JB, O'Keefe, J, and Hicks, RR (2001). Balance and mobility following stroke: effects of physical therapy interventions with and without biofeedback/forceplate training. Phys Ther. 81, 995-1005. Ryerson, S, Byl, NN, Brown, DA, Wong, RA, and Hidler, JM (2008). Altered trunk position sense and its relation to balance functions in people post-stroke. J Neurol Phys Ther. 32, 14-20. Weerdesteyn, V, de Niet, M, van Duijnhoven, HJ, and Geurts, AC (2008). Falls in individuals with stroke. J Rehabil Res Dev. 45, 1195-213. Yates, JS, Lai, SM, Duncan, PW, and Studenski, S (2002). Falls in community-dwelling stroke survivors: an accumulated impairments model. J Rehabil Res Dev. 39, 385-94. Hsieh, YW, Wang, CH, Wu, SC, Chen, PC, Sheu, CF, and Hsieh, CL (2007). Establishing the minimal clinically important difference of the Barthel Index in stroke patients. Neurorehabil Neural Repair. 21, 233-8. Veerbeek, JM, van Wegen, E, van Peppen, R, van der Wees, PJ, Hendriks, E, and Rietberg, M (2014). What is the evidence for physical therapy poststroke? A systematic review and meta-analysis. PLoS one. 9, e87987. Puckree, T, and Naidoo, P (2014). Balance and stability-focused exercise program improves stability and balance in patients after acute stroke in a resource-poor setting. PM R. 6, 1081-7. Tan, Z, Liu, H, Yan, T, Jin, D, He, X, and Zheng, X (2014). The effectiveness of functional electrical stimulation based on a normal gait pattern on subjects with early stroke: a randomized controlled trial. Biomed Res Int. 2014, 545408. Chen, L, Chen, J, Peng, Q, Chen, J, Zou, Y, and Liu, G (2016). Effect of sling exercise training on balance in patients with stroke: a metaanalysis. PLoS One. 11, e0163351. Fu, J, Tong, S, Chen, Y, Yao, Y, Li, Y, and Wu, H (2012). The effect of sling exercise training on balance function of stroke. Chinese J Phys Med Rehabil. 34, 926-7. Saeys, W, Vereeck, L, Truijen, S, Lafosse, C, Wuyts, FP, and Heyning, PV (2012). Randomized controlled trial of truncal exercises early after stroke to improve balance and mobility. Neurorehabil Neural Repair. 26, 231-8. Copay, AG, Subach, BR, Glassman, SD, Polly, DW, and Schuler, TC (2007). Understanding the minimum clinically important difference: a review of concepts and methods. Spine J. 7, 541-6. Jaeschke, R, Singer, J, and Guyatt, GH (1989). Measurement of health status: ascertaining the minimal clinically important difference. Control Clin Trials. 10, 407-15. Van Dijk, C, Van Sterkenburg, MN, Wiegerinck, JI, Karlsson, J, and Maffulli, N (2011). Terminology for Achilles tendon related disorders. Knee Surg Sports Traumatol Arthrosc. 19, 835-41. Robinson, J, Cook, JL, Purdam, C, Visentini, PJ, Ross, J, and Maffulli, N (2001). The VISA-A questionnaire: a valid and reliable index of the clinical severity of Achilles tendinopathy. Br J Sports Med. 35, 335-41. Kyte, DG, Calvert, M, Van der Wees, PJ, Ten Hove, R, Tolan, S, and Hill, JC (2015). An introduction to patient-reported outcome measures (PROMs) in physiotherapy. Physiotherapy. 101, 119-25. Hayward, KS, Kuys, SS, Barker, RN, and Brauer, SG (2014). Clinically important improvements in motor function are achievable during inpatient rehabilitation by stroke patients with severe motor disability: a prospective observational study. NeuroRehabilitation. 34, 773-9. Arya, KN, Verma, R, and Garg, RK (2011). Estimating the minimal clinically important difference of an upper extremity recovery measure in subacute stroke patients. Top Stroke Rehabil. 18, 599-610. Pandian, S, Arya, KN, and Kumar, D (2016). Minimal clinically important difference of the lower-extremity fugl-meyer assessment in chronic-stroke. Top Stroke Rehabil. 23, 233-9. O'Dell, MW, Dunning, K, Kluding, P, Wu, SS, Feld, J, and Ginosian, J (2014). Response and prediction of improvement in gait speed from functional electrical stimulation in persons with poststroke drop foot. PM R. 6, 587-601. Gervasoni, E, Jonsdottir, J, Montesano, A, and Cattaneo, D (2017). Minimal clinically important difference of Berg Balance Scale in people with multiple sclerosis. Arch Phys Med Rehabil. 98, 337-40.e2. Beninato, M, Gill-Body, KM, Salles, S, Stark, PC, Black-Schaffer, RM, and Stein, J (2006). Determination of the minimal clinically important difference in the FIM instrument in patients with stroke. Arch Phys Med Rehabil. 87, 32-9. Van der Wees, PJ, Nijhuis-van Der Sanden, MW, Ayanian, JZ, Black, N, Westert, GP, and Schneider, EC (2014). Integrating the use of patient-reported outcomes for both clinical practice and performance measurement: views of experts from 3 countries. Milbank Q. 92, 754-75.
van Dulmen, SA, Lukersmith, S, Muxlow, J, Santa Mina, E, Nijhuis-van der Sanden, MW, and van der Wees, PJ (2015). Supporting a person-centred approach in clinical guidelines. A position paper of the Allied Health Community-Guidelines International Network (G-I-N). Health Expect. 18, 1543-58. Cott, CA (2008). Client-centred rehabilitation: what is it and how do we measure it?. Physiotherapy. 94, 89-90. Coulter, A, and Ellins, J (2007). Effectiveness of strategies for informing, educating, and involving patients. BMJ. 335, 24-7. Sumsion, T, and Law, M (2006). A review of evidence on the conceptual elements informing client-centred practice. Can J Occup Ther. 73, 153-62. Wressle, E, Eeg-Olofsson, AM, Marcusson, J, and Henriksson, C (2002). Improved client participation in the rehabilitation process using a client-centred goal formulation structure. J Rehabil Med. 34, 5-11. Kang, TK, Chae, BS, Ko, YS, Hwang, HS, and Park, HK (2003). Factors related to patient satisfaction in an outpatient clinic. J Korean Acad Fam Med. 24, 346-52. Lee, HJ, and Kang, SK (2011). Age and gender differences in cognitive functioning among elderly. Ment Health Soc Work. 37, 255-78. Kim, WH, YI, CH, Chung, BI, and Cho, SH (1998). Factors related to balance ability in healthy elderly. Phys Ther Korea. 5, 21-33. Hong, SY, and Lee, JW (2005). The relationship between visual perception ability and balance ability in herniplegic patient. J Korean Soc Occup Ther. 13, 63-71.